In a rigorous evaluation process, Gates Scholars are identified by academics in their fields of study, from Cambridge and other institutions of higher education, as exceptional researchers who have the ability to make a significant contribution to their intended disciplines. They are also recognized for their strong leadership skills and understanding of how their research can be applied to the challenges facing the world today. 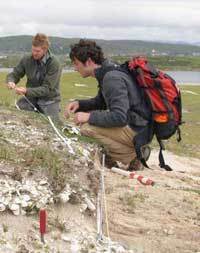 Lash’s involvement in research began right after his freshman year with the Department of Anthropology’s Cultural Landscapes of the Irish Coast (CLIC) project. Taking full advantage of Notre Dame resources that support undergraduate research and international study has helped Lash establish an impressive academic track record at an early age. Funding from the Institute for Scholarship in the Liberal Arts’ Undergraduate Research Opportunity Program (UROP) allowed him to do fieldwork at Mesa Verde National Park in Colorado. The Nanovic Institute for European Studies funded Lash for travel in Britain and Ireland to write a paper on the link between medieval castle architecture and elite identity formation. He spent his junior year at New College in Notre Dame’s Oxford program studying medieval history, literature, and archeology. This summer, he’ll return to CLIC for the fourth time and participate in a research project at Bective Abbey in Ireland. And then—on to Cambridge. At Cambridge, Lash will study the 200-year period in which Anglo-Saxon Britain became a Christian culture. Asked how he feels about the expectation that Gates Scholars’ work will make a contribution to improve the lives of others, the force of his passion for his research breaks the surface of his quiet demeanor. “I admit that medieval studies can’t help humanity in the same way that medical or scientific research might,” he says, “but my work has relevancy and will, I hope, contribute by allowing us to better appreciate the challenges, complexities, and consequences of public representations of the past. Originally published by Lisa Walenceus at al.nd.edu on March 02, 2010.